Many a time we come across a scenario where suddenly in production without any release or changes some query which was working perfectly alright till yesterday is taking too long to execute or consuming lot of resources or timing out. Most of the times such issue are related to execution plan change (commonly referred as Plan Regression). Till yesterday the query was running fine as it was running with good cached execution plan and today a bad plan is generated and cached. Because of this bad cached plan the query which was executing perfectly alright suddenly starts misbehaving. 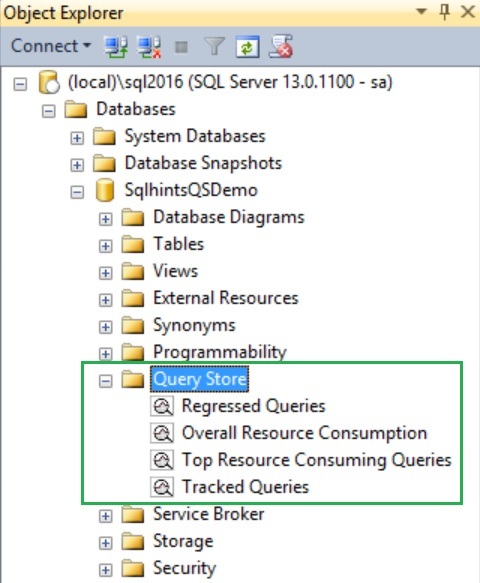 To identify and fix such performance problems due to the execution plan change the Query Store feature introduced in Sql Server 2016 will be very handy. Query Store basically captures and stores the history of query execution plans and its performance data. And provides the facility to force the old execution plan if the new execution plan generated was not performing well. Step 2: Step 1 Pops-up the properties window. In the properties window from the left navigation options select the new option Query Store. 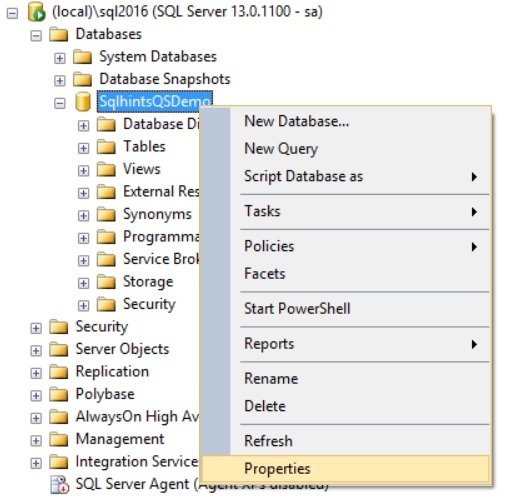 Below is the view of the properties window after selecting the Query Store option. Step 3: From the Query Store option window of Step 2 we can see that the Operation Mode (Requested) setting has three different options. Selecting the ReadWrite option will enable the Query Store and starts capturing the query execution data such as execution plan and it’s performance stats. 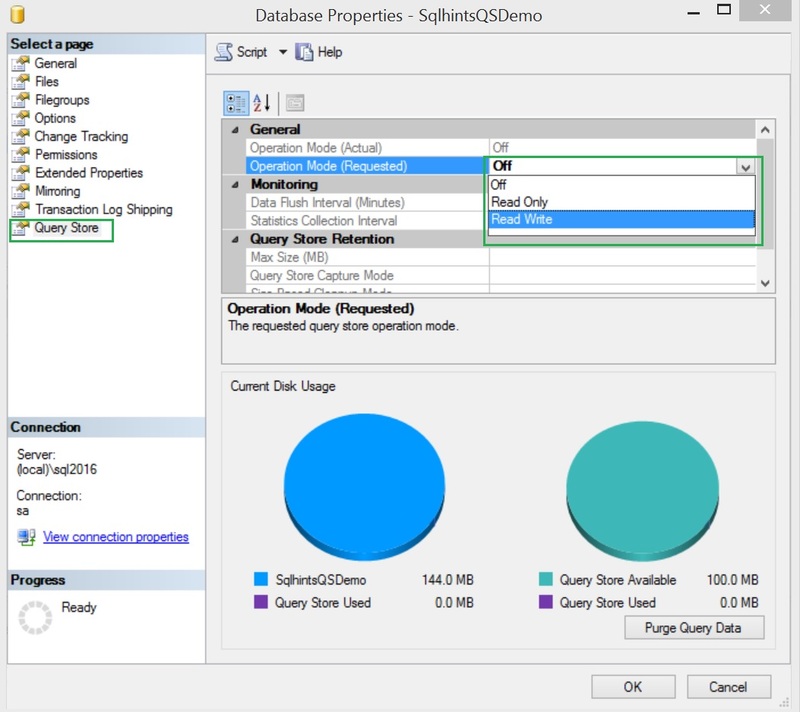 Selecting Read option will only allow the data to read from the query store but no new query data is captured. Below image shows the various query store options after selecting the ReadWrite Operation Mode. To know each of these options select the option it will display the details about it below. 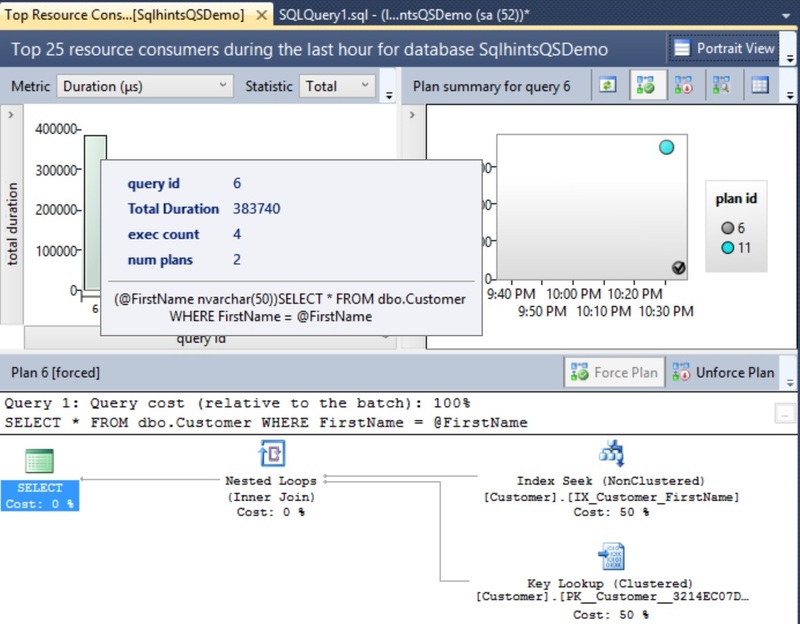 Query store captured data is stored in the respective query store enabled database. 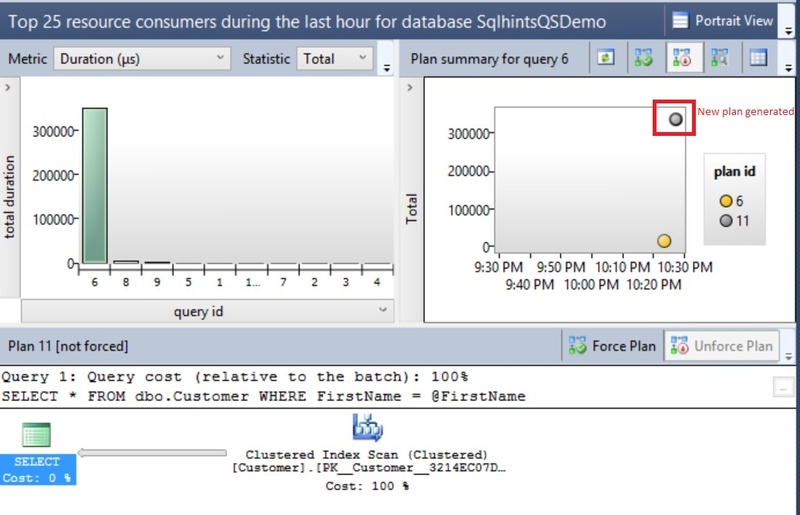 As we can see from the above image 100 MB is reserved for query store data in the SqlhintsQSDemo database. This value can be changed by changing the Max Size (MB) option value. Let us execute the following statement to get the details of the Customer whose FirstName is Xyz. While executing the below statement select the “Include Actual Execution Plan” option. 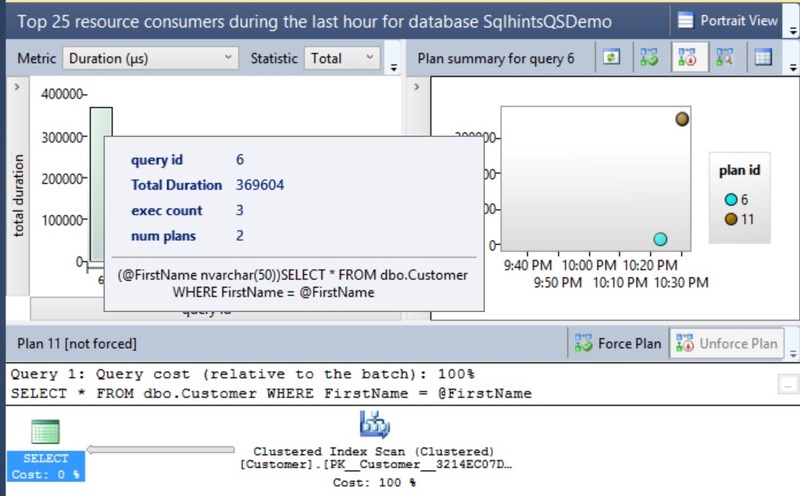 From the execution plan we can see that the Stored Procedure is using the Non-clustered index seek on the FirstName column to fetch the Customer details, which is the optimal option too. 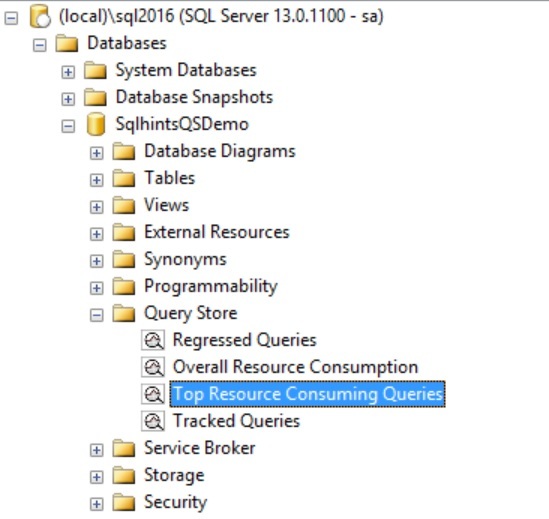 Below is the Query Store view of the “Top Resource Consuming Queries”. Here we can see that Plan Id 6 is corresponding to the above stored procedure execution which was using Non-Clustered Index Seek. Mouse over on the bar corresponding to the query which got executed by the SP GetCustomersByFirstName shows that it is executed ones, has one execution plan, it took 16129 micro seconds and query id is 6. After executing the above DBCC statement all the cached plans are removed from the cache. Now try executing the same stored procedure i.e. GetCustomersByFirstName but this time pass the @FirstName parameter value as Basavaraj instead of Xyz. While executing the following statement select the “Include Actual Execution Plan” option. Below is the view of the Query Store after executing the SP: GetCustomersByFirstName with @FirstName parameter value as ‘Basavaraj’. You need to refresh the query store if it is already open. Here we can see a new plan with plan id 11 is generated which corresponds to the clustered index scan. 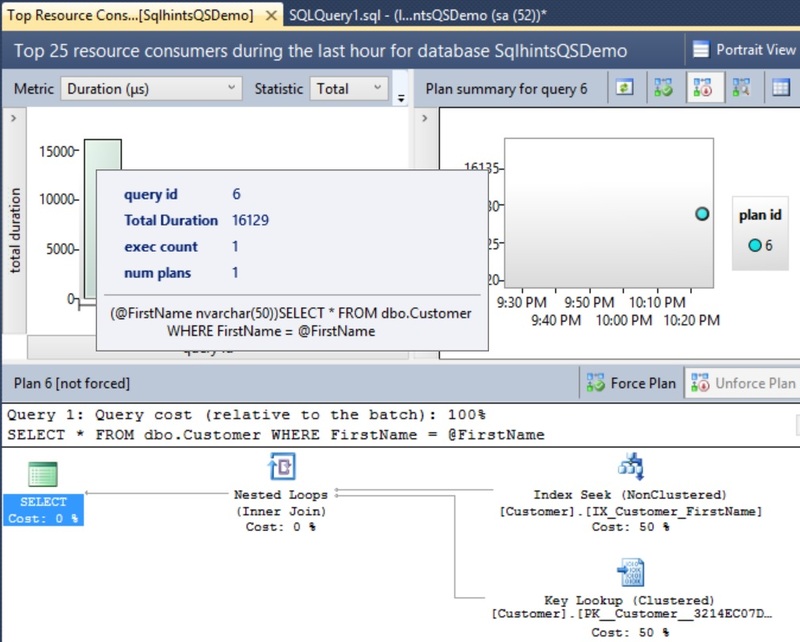 So we can see that now we have two query plans corresponding to the query executed by the stored procedure GetCustomersByFirstName. Let us again execute the following statement to get the details of the Customer whose FirstName is Xyz. While executing the below statement select the “Include Actual Execution Plan” option. From the result we can see that this time the stored procedure execution is using the Clustered index scan instead of the non-clustered index scan which it was doing previously. To get the customer details whose FirstName is ‘Xyz’, from the result we can see it is using the cached plan which is optimized/compiled for the @FirstName parameter value ‘Basavaraj’. This is how a perfectly working query starts misbehaving without any release or changes. Below is the view of the Query Store after executing the SP: GetCustomersByFirstName with @FirstName parameter value as ‘Xyz’. You need to refresh the query store if it is already open. Mouse over on the bar corresponding to the query which got executed by the SP GetCustomersByFirstName shows that it is executed 3 times and has two execution plans i.e. 6 and 11 and plan 11 which is a clustered index scan is the current plan. In the below image we can clearly see than plan 11 is taking more time to execute compared to plan 6. So, in this case it is optimal to execute the query with plan 6 compared to plan 11. From the above query store view it is clear that plan 6 is the optimal plan for the execution of the stored procedure GetCustomersByFirstName compared to plan 11 as majority of the time the stored procedure is executed with a parameter value other than ‘Basavaraj’. 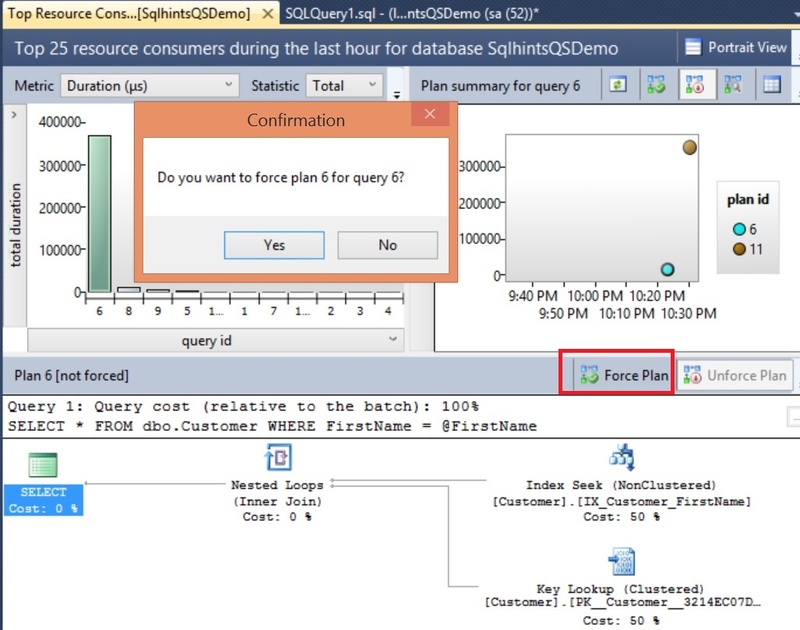 As shown in the below image query store gives an option to force the execution plan for the future execution of the queery. To force the plan select the plan 6 (i.e. light blue color circle) and then click on the Force Plan option. After forcing the plan 6 as shown in the above image. Now execute the GetCustomersByFirstName one more time with @FirstName parameter value as ‘Xyz’. From the above result we can see that execution of the SP: GetCustomersByFirstName with @FirstName parameter value as ‘Xyz’ is doing a non-clustered index scan compared to clustered index which it was doing previously. 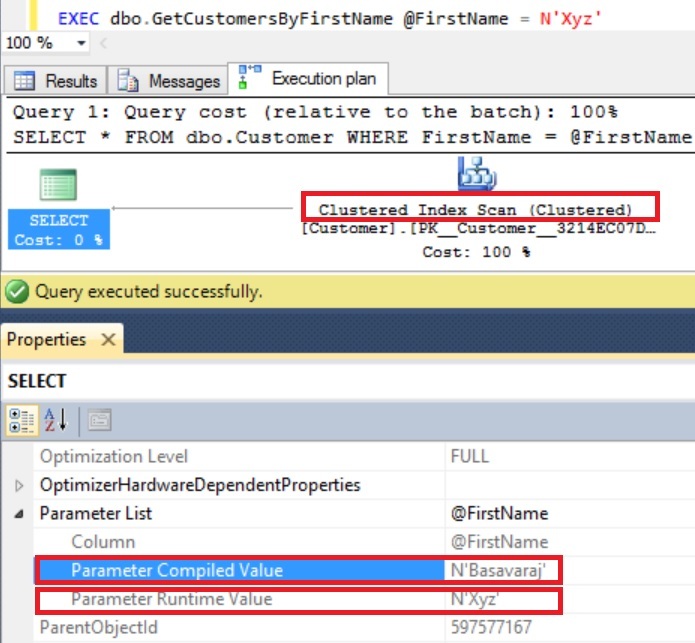 Below is the view of the Query Store after forcing the execution plan 6 and executing the SP: GetCustomersByFirstName with @FirstName parameter value as ‘Xyz’. We can see that plan 6 circle has a right tick mark, which means this is the force plan which now will not change even after server re-start. As shown in the below image adjacent to Force Plan option we have an Un-force Plan which an be used to un-force this forced plan.